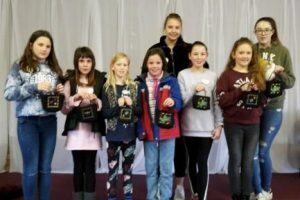 We had 9 Young Quilters attend the workshop on 24 February when they created the Ohio Star Block in the morning and worked on their Grandmother's Flower Garden Block in the afternoon. We had 8 Young Quilters attend the workshop on 10 March (4 from Norfolk and 4 visiting from Cambridgeshire Young Quilters). The YQs created a mini tote bag during the morning session. 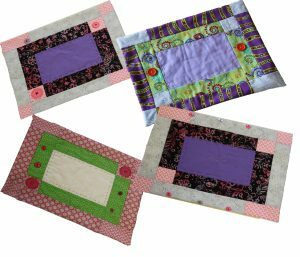 During the afternoon our visiting Young Quilters worked on a Grandmother's Flower Garden Block and the rest continued quilting by machine and hand their sample quilts. 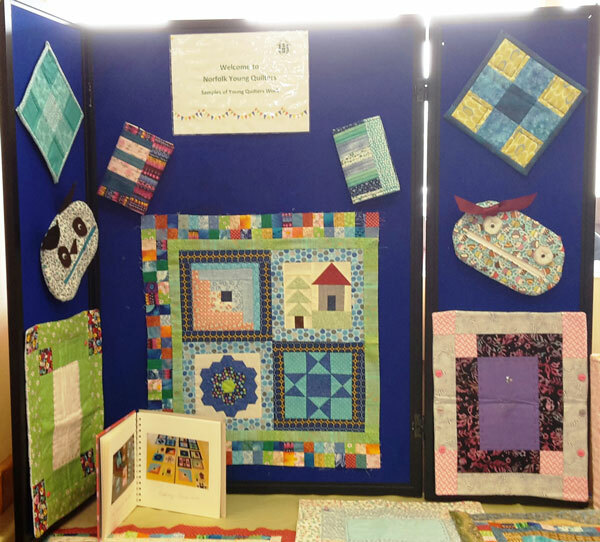 These two photographs show some of the excellent and varied work completed by the Young Quilters over the past year. Saturday 8th July 2017 - Table Mat. Techniques: Adding Sashing and putting together a quilt sandwich and hand quilting. Saturday 7th October 2017 - Log Cabin Block. Techniques: Fabric strips are sewn around the centre with light fabrics on one half and darks on the other, separating the block into two triangles of colour. 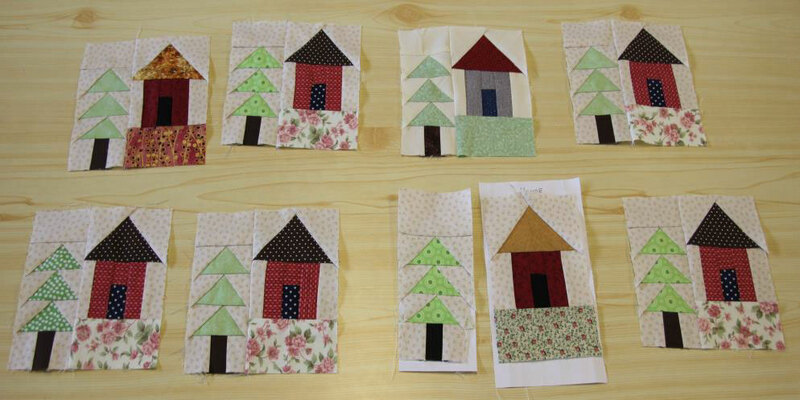 At the Attleborough workshop on 20 August 2016 the Young Quilters created a block using foundation paper piecing and this will be one of the blocks to be included in their final quilt. It was in two parts - a house and a tree block which were then sewn together. From the photograph here, you can see that they all did very well. 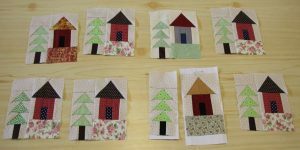 The Attleborough group created the Log Cabin Block on 19 November 2016 and this will be the final block to be included in their quilt. They also made cards to practice their hand sewing skills. The next workshop of this group will be on Saturday 11 March 2017 when they will be creating a zippy purse. On Saturday 5 November 2016 we ran our first workshop at All Saints Lessingham School, Lessingham (near Stalham). They created a small nine patch table mat. The next workshop for this group will take place during the spring of 2017. 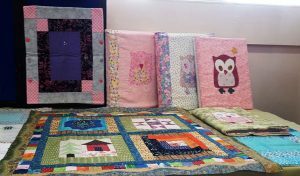 If you know any young persons (male or female) between the ages of 8 and 16 who are interested in learning to sew please ask their parent/guardians to email nq.youngquilters@gmail.com for more information. On 25th June the Young Quilters had a very enjoyable day creating a table mat. First they had to put all the pieces in order before they started stitching. They had to ensure the pieces fitted accurately. Finally they put a quilt sandwich together and added some embellishments and hand sewing. From the picture you can see they all did very well. A very big thank you to everyone who has donated material towards the Young Quilters’ stash. It will certainly help us to keep going for a short while.